carly tee: pretty pink posh turns 2! i can't even begin to tell you how much i love pretty pink posh! pretty pink posh sequins inspired me to create my first shaker card, which i'm now totally obsessed with (more on that later in this post). ppp sequins are pretty much always the perfect addition to a card. and ppp's amazing creator paulina is the nicest & sweetest EVER, she's even giving you presents on ppp's birthday (scroll all the way down to see what you're getting)! 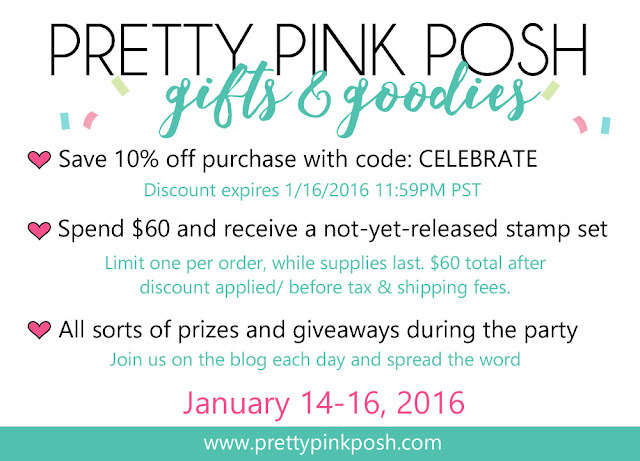 i'm trilled to help celebrate pretty pink posh turning 2! and of course i had to create some shaker cards (because as i mentioned, i'm obsessed). i combined the super cute ppp rainy days stamp & rainy day die sets with mama elephant bella letters and the "love" from essentials by ellen brushstroke christmas. for my umbrella shaker, i used the new & oh-so-fun share kindness mix. and for the cloud shaker, i used pink blush 6mm cupped sequins. i used the new ppp storybook 3 die to create the window for my shaker. i used it twice, once to cut the rectangle from my card front and then again to create a silver frame. i did some no-line watercolor rainbow stars with a essentials by ellen stamp from the brushstroke christmas set. i cut clouds from the ppp rainy days die set, inked them, gave them a coat of glossy accents and embedded some of the new silver mini star confetti. i also used the mini silver stars inside my shaker, along with clear sequins. Carly Tee Minner - you are here! Such cute shakers, I love making them too! The one with the cut out umbrella is my favourite but they're all great! The umbrellas and clouds as shakers are so incredibly adorable and I have to try that!! I am still new to cardmaking but I have fallen in love with PPP sequins, Lawn Fawn and making shaker cards! All your cards are really fun and looks like they'd be fun to recreate'! I love your awesome and adorable shaker cards! Those rainbow stars are great!! Thank you for the inspiration. Love all of your shaker cards. Love those umbrellas and you just make me want to buy more sequins!! Glad you're obsessed...I love shaker cards as well! Delightful little scenes you put together today. Absolutely fabulous! Love shaker cards and yours are just fab!! I am all about the shaker cards and using them in a cloud card is just so much fun. All three cards are gorgeous! I love the sequins in the umbrella and the sequins in the clouds. Pink cloud sequins, who would have thought! I really love the shine on gorgeous with the bling! I can see making that for several friends who love bling. This blog hop party is really, really inspiring me! It is making me fall in love with sequins! Your cards are so cute and pretty. You know how to get my attention with those cute sequin shakers. Shower the people you love! What fun shaker cards! Very creative and unique! Love the sequins and especially the sentiment...Shower the people you love! Wonderful. Stay blessed! Love the words of the song on your card-! The shower the people you love with love cards are super adorable. The shine on gorgeous card is great too. sooooo cute!! I love your cards!!! I love shaker cards and yours are so cute. Love your sweet shaker cards! So much FUN! I think these cards are wonderful and I can see making these to send to my older grandchildren. Great cards! I adorable the sentiments you used.Thanks for sharing! I love your shaker cards! They are my favorite type of card. And I am challenging myself to make all my birthday cards as shakers this year ... Thanks for the inspiration! Wow! Loving those shaker umbrellas! I need to follow your blog! Absolutely beautiful cards, love your creativity!! What a cute idea for shaker cards. Gorgeous shaker cards! I love the amazing color and the pretty designs! Wonderful shaker cards! I especially love the clean Design and look of the first card! great shaker cards - the shaker clouds are my favorite. Your cards are so much fun! I love the shakers, but the stars are my favorite! Great ideas for shaker cards - best way to show off all those pretty sequins. All three of these are beautiful but I absolutely adore the Shine on card!!! STUNNING! TFS! Love the cloud and umbrella shakers. Oh, you got me with your umbrella and cloud shakers! I like shakers cards too and your umbrella card is darling. I love the "non-traditional" style Valentine's Day cards. Added bonus is the shaker part! Cannot wait to do a shaker card! Love the way the clouds are created for the sequins. Umbrella's seem to be a new theme in the industry but they seem to be so appropriate for living in WA state. LOL! Beautiful cards. LOVE the cloud shakers. Brilliant. Awesome cards. Love all the sparkle. Love the falling hearts on the umbrella card! So perfectly pretty! The first 2 umbrella cards took my breath away.. gorgeous.. Such a different way to create shaker cards. Love the clouds as the shaker part. Such a super cute shaker! Amazing shaker cards. The cute umbrellas and the starry sequins are gorgeous! Way too cool cards! I have got to get some sequins! so pretty! love the sequins! Cute cards! I like the hearts falling from the pink sequin cloud shaker. Wowzers! The umbrella shakers are adorable and that Shine On Gorgeous is...gorgeous!!! WOW! These are fantastic cards! such innovative use of the shaker card style. all of them are fun. I just love these dies from PPP and your sweet card designs! Is your 2nd card a see-through shaker card? If no, somehow it gives me that illusion. Nice combination of stamps from different companies. It extends the use of our stamps, not limiting us to one brand only. These cards are so sweet!!!! Lovely creations!!!! This is such a sweet card....I really love this stamp set. i love your rainy umbrella cards, to cute! Just ordered the storybook 3 die..cant wait for it! You inspire me with your art. I love the mini shaker windows, they are so creative! Carly these cards are so pretty!!! I love shaker cards too... and PPP has the best sequins for shakers.... and now the dies are starting to become a must have... such pretty cards... I really like the how the clouds are the shakers in the first card... so cute! TFS! The shower cards put a smile on my face. Thanks for the tutorial. love the sequins and how you have used the dies. I adore shaker cards. Great cards. You're right! They have WONDERFUL sequins! Shaker cards in any theme are darling....but rainy day shakers are specially cute! Oh my I love the shakers card! The Rainy Days set is fantastic. what a cute idea with the sequens in the umbrella,a bright rainy day. I love the way you made the clouds and umbrella shakers. Such cute shaker cards! Love the idea! all your cards are so sweet!! Love that you made the clouds into shaker elements! You really know your way around a shaker card...these are fabulous. What absolutely beautiful shaker cards. I'm just in love with the umbrella and seeing it and the cloud as a shaker is just too sweet. What beautiful work. Thank you for sharing your ideas. So bright and happy. Love the colors. I love your umbrella shaker cards, especially the pink one--it works so well with the falling hearts. Very original cards, I love umbrella shaker and this colours. Lovely cards! I especially like the shaker umbrellas! I love the pink clouds................so cute. I love your fun shaker cards and especially love how you created your own sentiment on the umbrella card! 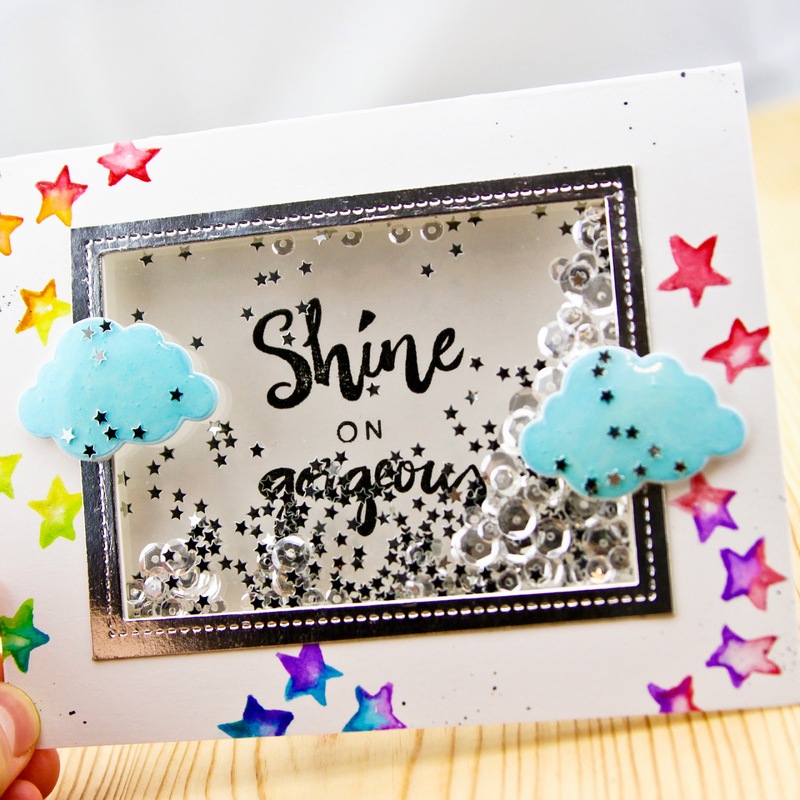 Carly, Your cards make rainy days fun and bright! Great cards. I love shaker cards. You are the master at the shaker cards! What fun shaker cards! I love that one has sequins in the umbrella and another has them in the clouds. Great set! Your third card is beautiful with the vibrantly colored stars and all the sparkle and shine of the sequins and star confetti. Love how you used each set of sequins as a design and color element for all of your cards. Fabulous! Oh my I LOVE your beautiful cards!!! Wow, I love the sentiments on all your cards. The sparkle on the second card is just gorgeous!! So beautiful, I feel like playing in the rain! Love your shaker cards - so pretty! Love your shaker cards! Nicely done. Love the shakers as part of the umbrella and the clouds - such a cool spotlight! Great, colorful cards! Thanks so much for sharing. Such clever shakers. I love the use of the clouds and umbrella. So cute! Such fun shaker cards, full of sparkle and shine! Absolutely love your shaker cards. The sequins in the clouds look fantastic. I love shaker cards! I like your idea of unique shaped windows instead of the usual circle, rectangle, or square. Fabulous shaker clouds and umbrellas and hearts raining down. Ohhhhh I love all these shakers!!! The last shaker is gorgeous! I love the umbrella shaker! So clever. Did you have a problem getting the tape around the curve? I have only made one and had a bit of a fuss over the heart shape I chose. Should have done square or rectangle the first time out. Didn't turn out too bad, though. Thanks for a cute project. Oh my word Carly, these cards you've created are all amazing. Just beautiful. I love these sequins, not to mention the wonderful new product. These new dies I have been seeing are awesome! How clever love the umbrella's filled with sequins soon cute. Love your cards!,,, love the sequin filled umbrellas, too cute! Your cards are beautiful with their simplicity. Thanks for the inspiration! Have a great day! Too cool the shaker cards are cute!!!! Your cards are so amazing! I love the sweet sentiment on the first two cards and the stars and shaker on the last one. Thanks for the inspiration. I love the way you turned the umbrella into a shaker! Wonderful cards! These are amazing shaker card!!! I love these cards! That was one of my favorite songs! Your umbrella shakers are so fun! Very cut shaker cards!! I especially like the pink clouds!! Love the umbrellas on the cards. Gorgeous!! Shakers are so much fun-I like making them too!! Great shakers and fun. Thanks for sharing. I love shaker cards and these are just so awesome. love the shaker umbrella cards! Really like your original use of the cloud and umbrella as the shaker Windows. Oh my gosh!! Loving your shaker cards and all the colors you used!! Love the umbrella shaker cards, so cute! Awesome cards love how you made them into shaker cards. Very cute cards!! Love the umbrella one and adore the sentiment!! Oh My, I love these! I absolute adore these shaker cards - perfect for boys and girls! Love your shaker card creations. LOVE these shaker cards. Thanks for the inspiration. Shakers and bling. Great combination. I really like the umbrella cards. They are so cute as a shaker. Adore the shaker cards! You are so creative! Great shaker cards! 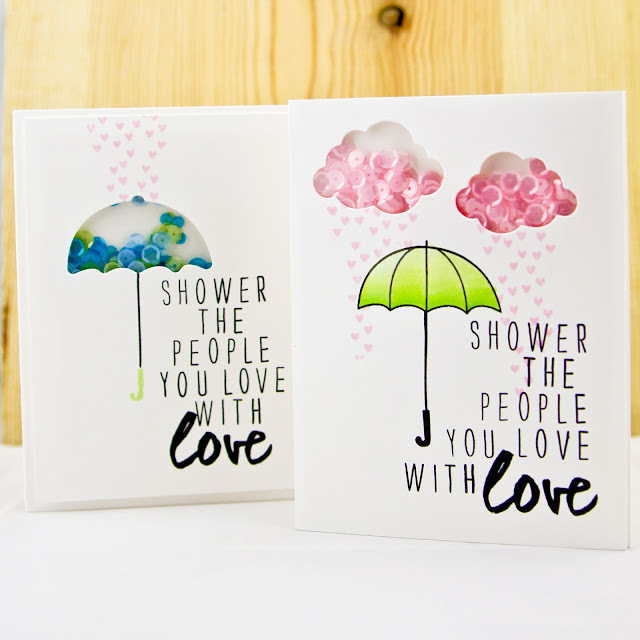 Love the new rainy day stamps and dies! Awww super adorable cards! I love the shakers. Love love love the umbrella shakers!!! Your shaker cards are awesome .... love those PPP sequins! Your umbrella cards are adorable & with such a sparkly encouragement card, they won't feel blue for long. These shaker cards are so creative and fun! Loving those little shaker clouds! Pretty and playful shaker cards. I have got to make some. Awesome shaker cards! Love 'em all! I love the little shakers in the umbrella cards, using the umbrellas and the clouds as your shakers...great idea. And your other black and white shaker card using the whole card is also very pretty. Love the rainbow stars and raining hearts!! What a great celebration, Congratulation ! These cards are so cute ! 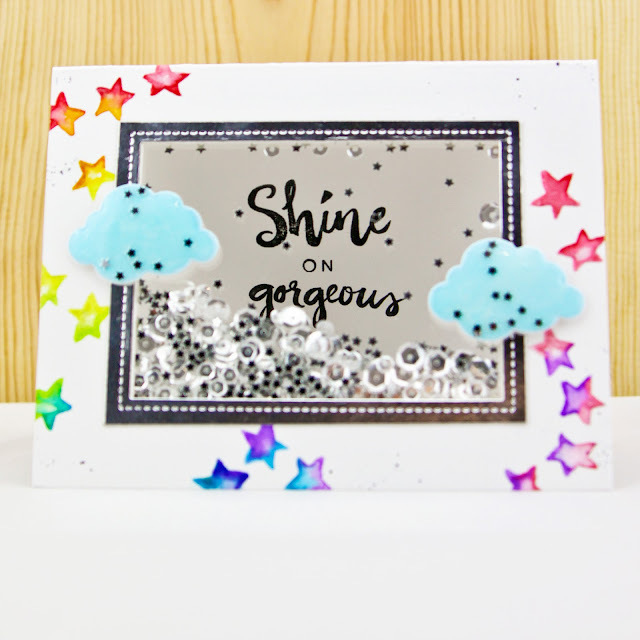 Pretty and playful shaker card! Nice! Love shaker cards also, both of yours are darling. What happy and uplifting cards! I love the shakers, and use of cheerful colors. Really beautiful shake cards. Umbrellas are so sweet. Adorable and fun cards. Love the colors. Love your adorable shaker cards! So fun and smiley!!! Love the umbrella and cloud shaker cards! What a great idea! Such cute shaker cards. Thanks for sharing. I really like the umbrella shaker card! What a great idea! Your shaker cards are perfect! Thanks for sharing! Love your shaker cards. The umbrellas and the clouds used as the shaker card are great! Super cute shakers! Love that sentiment on the first one! Wow these are just awesome! I love them both. Thanks for sharing them with us. Such cute shaker cards especially the first card!